My left brain loves order, grids and structure, and many of these pieces initially called me from this perspective. Yet my right brain loves it when the matrix begins to slip, becoming slightly askew . . . and I was delighted to discover other images that dissolved into mystery and intrigue from a less structured base. While browsing the online SAQA gallery of thumbnail images, I began to identify “matrix” as my theme . . . but I didn’t realize there would be more connections to come. Some beautiful artwork by Kevan Lunney appears in this collection, even though it represents more of the “mystery and intrigue” end of my theme than any type of grid. It was her gold, bronze and cream colorway that first caught my eye; then the detail and depth of her surface design captured my attention — and still will not let it go. It took me a while to connect that Kevan and I had met briefly at the SAQA-SDA conference recently, but only because we’d connected in another online venue just this month that led me to read about her self-portrait project. But then as I looked at the closeup of her SAQA piece again while writing this post, I also realized that I’d been captivated by another of her pieces at Art Quilt Elements 2012 — where it won the SDA Surface Design Award. Kevan has certainly created an amazing body of work in her “archeology” series, so I hope you’ll check it out! Don’t you just love synchronicity? Have you experienced it lately? November is month two of the SAQA Visioning project — and my design focal point for the month is line. I have been sketching daily-ish, remembering to try different designs featuring lines. I recently attended Hollis Chatelain’s lecture about the similarities between drawing and quilting at the International Quilt Festival, and enjoyed the slide show of art quilts and her description of how each artist used design principles, including line, in each piece. My small quilt for the month features many types and layers of lines – the luscious and luxurious marbling, the bolder graphic lines of a silk-screened image, and the sharp, angular quilting lines to finish it off. Whew, it feels good to have this done as the month was just beginning when I finished! But Melanie Testa has just announced her 30 Lines in 30 Days project … will I be able to resist? Newsflash: “Linear Lines” and its companion piece, “Simply Shapes,” will be on display at the S.P.A.C.E. Gallery in Burlington, VT December 3, 2010 – January 29, 2011. 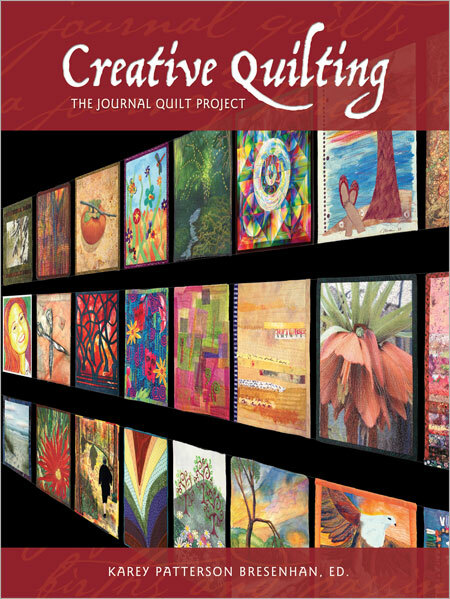 In October 2010, members of Studio Art Quilt Associates began a new year of the Visioning Project. I was hesitant to join, but am delighted with the progress I’ve made in just the first month! If you’re not familiar with SAQA’s Visioning Project, it is championed by former SAQA President Lisa Chipentine and an advisory board consisting of Judith Content, Karey Bresenhan, Dr. Carolyn Mazloomi, Jeanne Beck, and Regina Benson. Each member commits to a goal and develops specific plans to meet that goal during the coming year. There are monthly conference calls if you’re so inclined to discuss your progress and challenges, but other members seem content to post their progress to their personal wiki page within the project’s wiki space. Members support each other and correspond via secure messaging within the wiki space. So what does all this have to do with SHAPES??? A part of my goal for the year is to make more art. In addition to committing to making one full-sized art quilt or other piece each month, I’ve also chosen to explore design principles and elements through a series of small quilts. It’s serendipity that there are twelve design elements and principles, so I get to focus on one each month — beginning with shape. So, just in time to meet my 10/31 deadline – here’s my exploration of shapes, featuring machine applique over a screen print of an earlier art quilt, digitally manipulated in Photoshop to create a new image that I exposed as a photo emulsion silk screen. I screen printed that image onto a piece of hand marbled fabric. Yowza! Maybe this piece should be more about layers than shapes??? Next up, Lines. November, here I come!